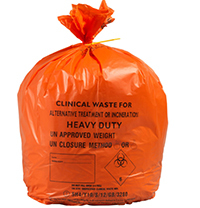 Orange clinical waste bag for waste which may be "treated" or incinerated. A UN approved 5kg bag for use in bag holders. Rolled to fit dispensers on the wall for easy access.